Saturday Luncheon Train - "The South Yorkshireman"
This train runs on Saturday lunchtimes through the year, except during certain special events. 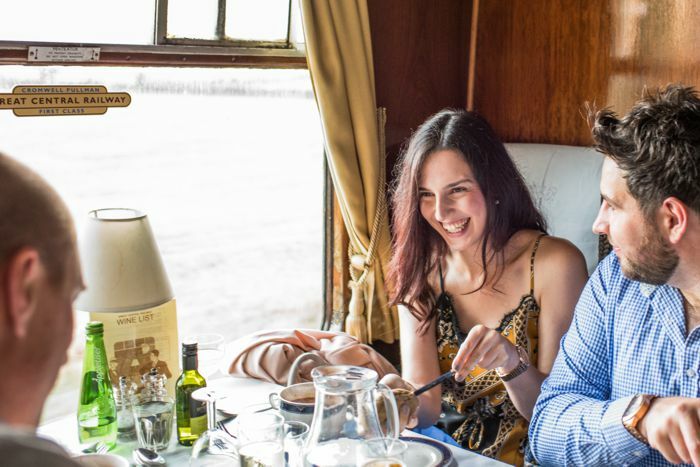 Your three-course lunch is served aboard our First Class Restaurant Cars as a steam locomotive takes you on a leisurely journey through Charnwood's glorious countryside. Your meal is served during the journey and there will normally be a pause on Swithland viaduct with its magnificent views across the reservoir to Charnwood Forest. The train departs from Loughborough Central at 1.00p.m, returning at approximately 2.45pm. Tickets are £46.00 per adult / £36.00 per child. The price includes the full cost of the train ticket. At weekends, rail travel is unlimited on the date of dining. 5th to 19th Jan, 2nd Feb to 2nd March, 16th Mar to 25th May, 8th June, 22nd June to 28th September, and 12th Oct to 30th Nov.
Butternut squash half, filled with cannellini beans, mozzarella cheese, peppers & tomatoes, topped with pumpkin & sunflower seed crumb. Mediterranean casserole with peppers, courgettes, lentils, sweet smoked paprika and thyme – suitable for vegans. Roast pepper stuffed with courgette, sun dried tomato cous cous and topped with feta cheese.